Can you believe it’s April? Wowza. No April Fools’ jokes on MGNN today, but I must admit that I fell for a few other bloggers’ fooleries today, (like HTP’s dog cloning post!) before realizing the date. Since it is April, that meant I didn’t have much longer to use my second LivingSocial deal for brunch at Ravens Club, before it expired. Like last time we had brunch at Ravens Club, I again forgot my camera, and had to make do with lower quality iPhone pictures. 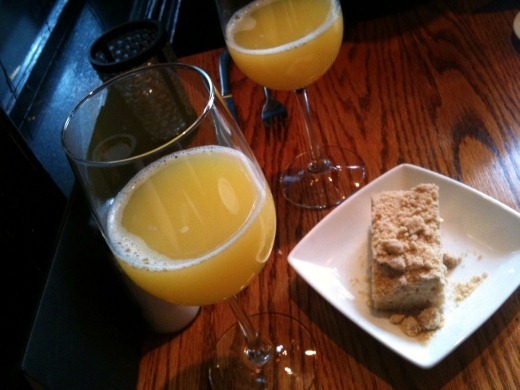 Mimosas to start, with a complimentary pastry. Really good mimosas! Also like last time, I again ordered an omelet. 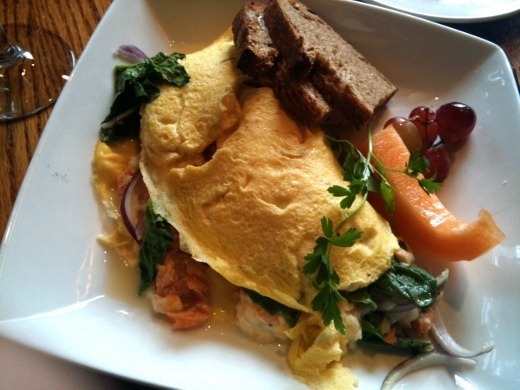 Last time I had a shrimp omelet, and this time I ordered the smoked trout omelet, with spinach and red onion. This omelet was BIG and contained LOTS of smoked trout, which tasted amazing! This was my first time trying smoked trout. I am a huge fan of smoked salmon, and as expected, smoked trout was similar, and in this case, also equally delicious. I liked this smoked trout omelet better than the shrimp omelet I had last time at Ravens Club – it was really tasty. Ravens Club isn’t the only local eatery at which I’ve had seafood-containing omelets! Last year I had a smoked salmon omelet at Café Zola for my birthday. Mmm, yummy! I had a bite, slathered in the pecan butter and dipped in cherry compote and it was most delicious. On the side the huz ordered a side of bacon, but I was not at all a fan of Ravens Club’s bacon (shocker, I know!). It was too… meaty? And not salty nor smoky enough. Sorry. 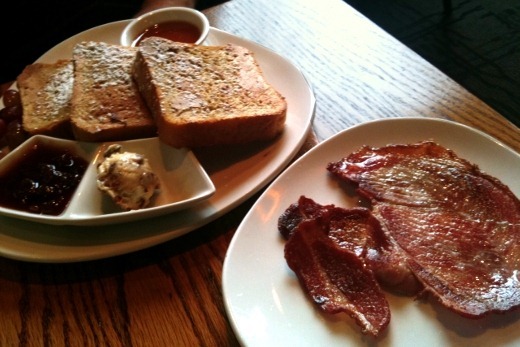 Huz liked the bacon though, and we both thought the French toast was great! I love Ravens Club’s focus on local and organic ingredients, which form the basis of their eclectic menu. 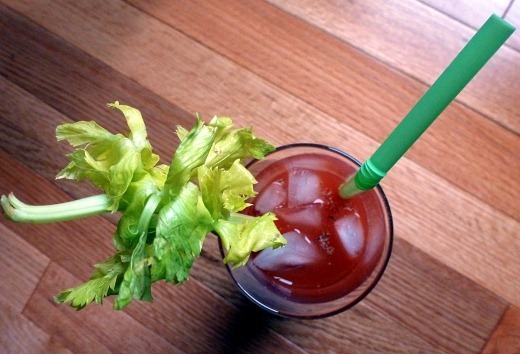 After brunch I was feeling a little mischievous, and we may or may not have consumed a Bloody Mary at home. 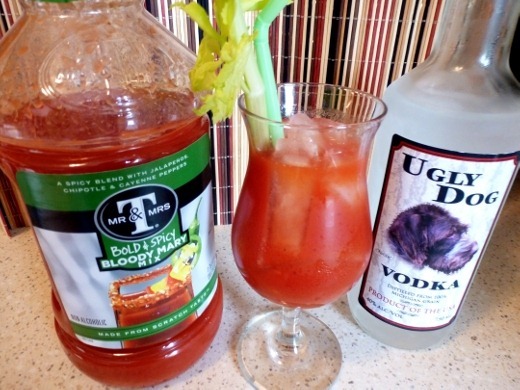 Blood Mary made with Ugly Dog Vodka, made by a Michigan company (based in Chelsea), and distilled from 100% Michigan grain, which came highly-recommended by the guy stocking the liquor aisle at Meijer. I have to say my Bloody Mary was delicious, but this Bold & Spicy mix was so, well, bold and spicy, that I can’t tell you too much about the vodka. I will have to try it in a martini and get back to you, but so far I like it! 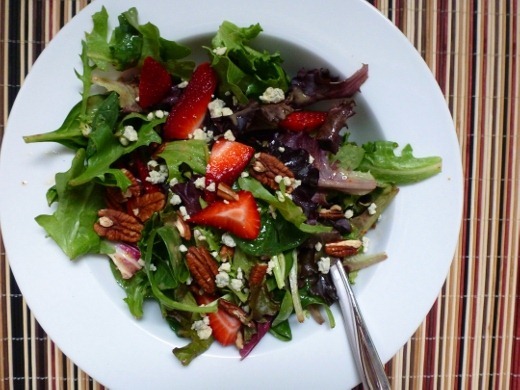 For dinner I started with a giant bowl of baby greens tossed in Hadley’s Honey Mustard salad dressing, with pecans, strawberries, and gorgonzola cheese. 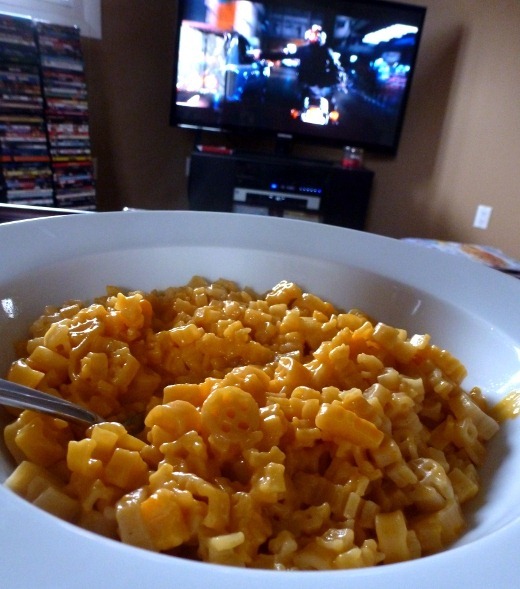 Then… Macaroni and cheese with The Hangover II on DVD from Netflix. Can you tell I was cooking for one tonight?! 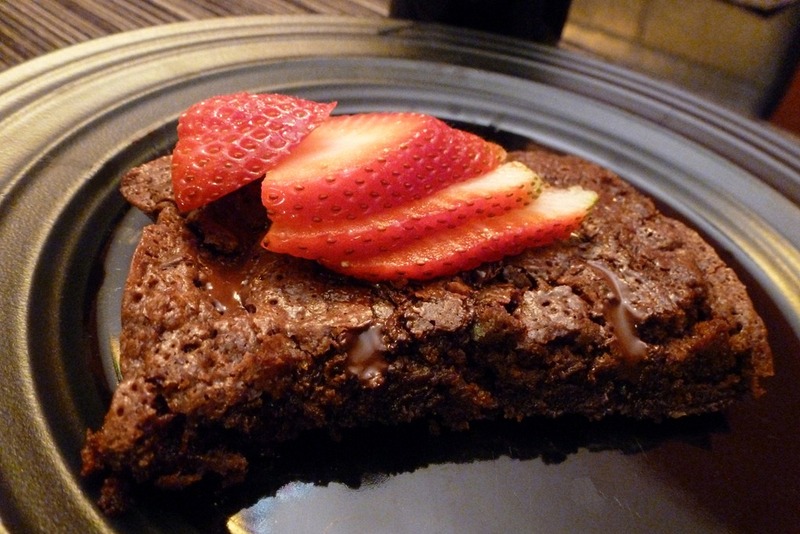 For dessert, I had the last third of the Brownies for Two that I predicted I would make last night (and obviously did)! Heavenly. I’m not ready to face Monday tomorrow! Gah! Currently listening to: A Punchup at a Wedding – Radiohead. Pingback: Palak Paneer and Red Kidney Beans Curry « Meg.Goes.Nom.Nom. Pingback: Brunch at Grange « Meg.Goes.Nom.Nom.